While I am a fan of Metroidvanias, I had mixed feelings about the first Guacamelee! Sure, it was fun and colorful, but I also felt the combat was a bit cumbersome at times. That went double for some of the crazy platforming challenges littered throughout the game. But when I saw it had a sequel, and after reading the full thoughts from a fellow author, I decided I might as well see what all the fuss was about. First, I’m happy to say I feel they improved the combat in Guacamelee! 2. While most of the moves you’ll learn were available in the last game, they seem integrated with more fluency. I didn’t have issues with controls until relatively later in the game, with one mild exception – the dodge roll. While it’s useful in combat, I could never seem to utilize it effectively when mobbed by foes. I also don’t know if this was by design or just my own incompetence, but I could never dodge roll away from attacks in mid-air. Maybe I was spoiled by the incredibly useful dodge in Sundered: Eldritch Edition, but it’s hard to go back after experiencing such precise controls there. The one area that I feel combat is massively improved is in chicken form. William went on at length about how amazing the inclusion of chicken lore is in Guacamelee! 2, and I couldn’t agree more. For one thing, you’re essentially a feathered bullet in that form. So besides being a super tiny target that’s harder for foes to hit, you’re faster, can fly around like a homing missile, and can still use regular attacks and throws. The only downside to chicken form is that you can’t use Juan’s signature wrestling moves like the Frog Slam and K.O. Headbutt, but other than that, I found his pollo powers to be quite impressive. But that’s not all! There’s a wealth of zany chicken related madness in the game, from the character I call the Chicken Pope to a Devil transformed into poultry to even a costume that would make Gus Fring proud. There’s even an optional dungeon that requires finding 5 parts to a special chicken key. I admit I haven’t accomplished that yet, but I’ve found most of them. So while I can’t say exactly what secrets hide in that optional area, I’m sure they’re delicious. In fact, there’s a lot to do in Guacamelee! 2, perhaps more than even in the original. While I beat the original game and had little to no desire to go and 100% find everything, that desire was much stronger here. I’m not sure exactly why, other than perhaps smarter design and better implementation of hazards and foes. Don’t get me wrong, the enemies are plenty challenging and some of the hazards are harrowing, but not generally so overwhelming I wanted to rip my hair out. Not so in the first game, which had many frustrating sections. Though I beat the sequel in only 7 and a half hours, I did so with a mere 42% of the secrets found. Since then I’ve spent another couple hours playing, and I still have more to find. So if you’re looking for a linear experience, you’ll find that here, but there’s also plenty of room to explore. And that likely goes double if you decide to purchase the DLC to open up even more areas to explore. While there’s a lot I enjoyed about the game, there are a couple areas it fell a bit flat on my Switch. First of all, when you start up the game, you’re met with a prompt to pair your controllers for multiplayer. As I was playing single player portably, I was understandably confused. It turns out, you can press B to skip that prompt and go to the start screen, but I would have much preferred you could set up the players later on. Another more substantive issue is that the buttons for transforming and dodging are a bit too close on the Switch console, making it so occasionally I would get them mixed up in the heat of battle, with lethal results. And once I was exploring postgame, I even found the music cut out entirely in one area for a long period of time, only to start up again randomly after several minutes. Another area I feel the game missed the mark a bit was with the plot. To clarify, it’s a fun and silly quest, and I’m fine with that. Juan is dimension hopping to stop a twisted lucahdor from gaining ultimate power. That’s not a problem. What is more of a problem is that I didn’t feel I knew a blessed thing about the villains in the game. How did they become a group? Why are they obsessed with their goal? And an even more important question, why is the main villain’s luchador mask seemingly infected with evil snakes? There’s a lot of themes they could have spent just a bit more time with to ground the details in the story, which would have made me care more. As it is, there’s a great game to play structurally, but you won’t really get attached to many of the characters. Which is a shame in a game universe this colorful. 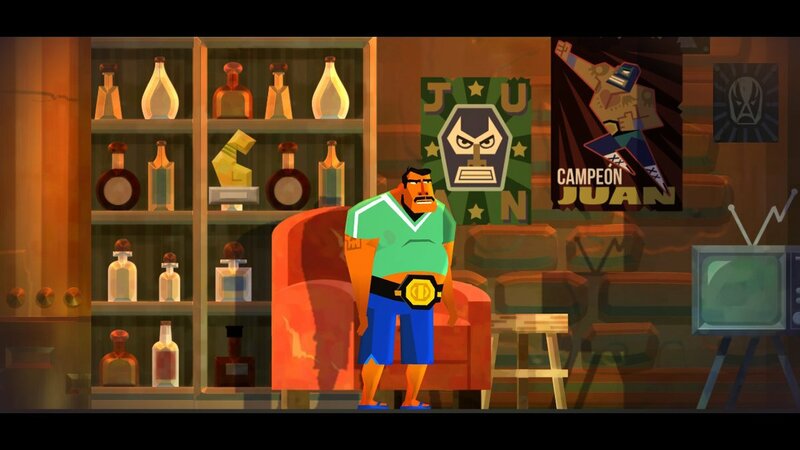 However, despite those shortcomings, you can pretty much ignore them due to another factor – the humor in Guacamelee! 2. Sure, there was a lot of random jokes and memes in the first game, but there’s even more nods to other classic games here. I won’t spoil it all, but just some of the games referenced are River City Ransom, Sonic the Hedgehog, Pac-Man and much, much more. I laughed out loud a couple times at these segments, and they did a good job of placating me when I was disappointed by other factors. Overall, I can easily recommend Guacamelee! 2 to fans of Metroidvanias, fans of the original game or fans of Drinkbox themselves. It’s a lighthearted adventure that’s a lot of fun. Despite the linearity and a plot that didn’t feel that fleshed out, it was a lot more good than bad. So if you have $19.99 to spare and can look past a few wrinkles, it’s well worth your time.